A slider displays the range between which the user can choose a value. The at most left value is the minimal value, the at most right the maximal value. The slider consists of a horizontal strip divided into two parts by a control. The left highlighted part corresponds with the value that’s currently selected. The right part shows how much room the user has to adjust the value. …and the corresponding value is displayed (this is optional), or played when the value concerns a sound volume. The slider is applied usually in a set up view, where the user has to enter a value for something, like a distance or a sound level. The user can make a choice throughout a (wide) range of allowed values. When there are just a few options available to choose from, consider using radio buttons or a spinner. When the range of values is big, it's harder to enter an exact value. 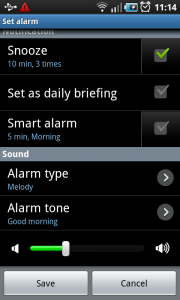 1 To change the sound level of the alarm, a slider can be used. 2 When the slider is selected and dragged, it is highlighted, and a number for the corresponding level is displayed for a second, fading out when the user lets the control go. 1 The slider for setting the search range is default set at the minimal value. 2 When the control is selected and dragged to the right, the value for distance goes up. 3 When the user lets go, the control is not highlighted anymore. 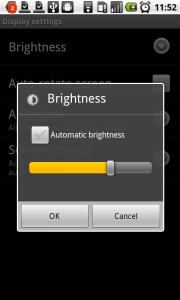 1 The brightness settings of the Nexus One opens as a dialog. When the control is selected and dragged to the left or right, it is highlighted. 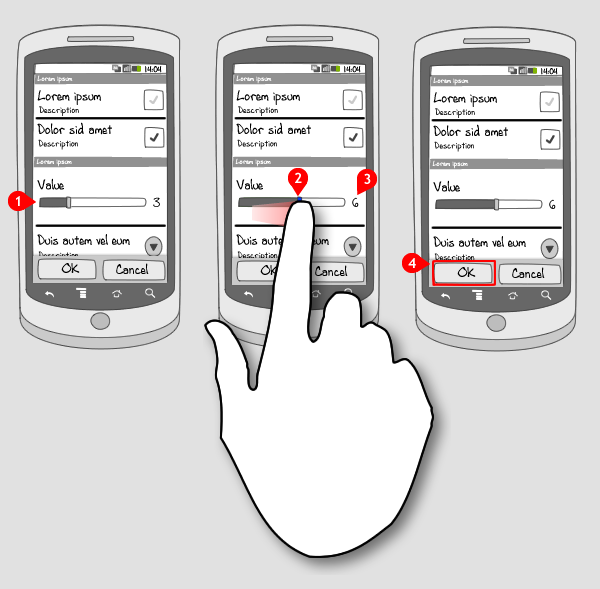 2 And when the user lets the control go, it is not highlighted anymore. The value will be entered when OK is tapped. On using slider I find it hard to get the correct number for larger sets of values. For this I use plus and minus buttons on either side of the slide allowing the user a finer step of control over the slider value. I have a custom component that has a plus and a minus button ot the left and right, and in the middle there’s an EditText that accepts only numbers and has a default value. This way the user can type the value he/she wants, and there’s there are the plus and minus buttons for tuning. 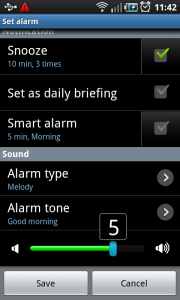 Also the buttons increase and decrease the value every 0.05 seconds by one if the user holds down one of the buttons. Other ways to let users enter a value?